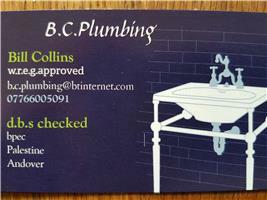 B.C.Plumbing - Plumber based in Palestine, Hampshire. We are now in a good position to take on work at short notice. Please don't hesitate contacting me if you have any problems and need some plumbing work done. I also specialise and install the country's leading top water softener. For a free no obligation demonstration and quote, just contact me. Andover, Basingstoke Hampshire, Devizes, Marlbough, Newforest area., Salisbury, Southampton, Wiltshire, Winchester or any where with in a twenty mile radius.